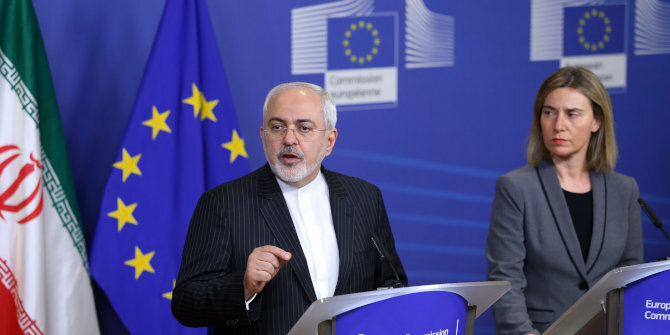 Tensions have grown in recent months between the EU and the United States over Iran, which was underlined at a US-backed conference on the Middle East in Poland last week that was largely sidestepped by many European governments. Cornelius Adebahr writes that the EU is right to take a more comprehensive approach to the region and resist attempts to demonise Iran, but it must carefully craft its approach to avoid endangering the security alliance with the US that it depends on. An unassuming conference on “Peace in the Middle East”, held in Poland last week, epitomised the split between the EU and the United States over how to address the challenges emanating from Iran. The differences in attendance were glaring: Washington sent its Vice-President and Secretary of State, Israel its Prime Minister, yet most EU member states opted not even to dispatch their foreign ministers, while Federica Mogherini, the EU’s foreign policy chief, said she could not travel altogether due to scheduling conflicts. Given that Israeli leader Benjamin Netanyahu bluntly spoke of an Arab-Israeli gathering “to advance the common interest of war with Iran”, the Europeans may feel vindicated in their decision. Yet avoiding the embarrassment of being associated with warmongering while trying to save the nuclear deal is one thing for the Europeans. Defining – and executing – an autonomous approach towards Iran that differs from the “maximum pressure campaign” of the Americans without banding up with Russia or China (let alone Iran) on broader geopolitical issues, is quite another. As it happens, among the many issues that the EU and the US currently disagree on, from trade to climate change policies to global order, the Iran file stands out – not least for its urgency, as a miscalculation or bad faith on either side can quickly turn into the war that Netanyahu mentioned. Truth be told, the EU and the US have not seen eye-to-eye on Iran for most of the Islamic Republic’s now 40-year history. Traumatised by the 1979-81 hostage crisis, Washington has consistently opted for a more hard-line approach, using sanctions and threatening military action to bring Tehran to its knees. Today, more than ever, Washington aims at regime change as a matter of principle. The Europeans, in contrast, with variations between countries like Britain and France taking a tougher line than, say, Germany and Italy, have refused to demonise Iran. They too see the country as a challenge, both regionally and to their own security interests, but they want to address these without per se delegitimising the country or its threat perception. Hence, the transatlantic unity displayed by the “two-track approach” of nuclear diplomacy and economic sanctions leading to the 2015 accord was the exception rather than the rule. Obviously, things took a dramatic turn when the current US administration abandoned the deal in May 2018, but the EU decided to stick to it. Washington has since tried to pressure Europe into compliance with its new policy, while telling major EU-based multinationals outright to end their Iran business – “or else”. The problem is that it was Washington’s U-turn on the Iran deal that created this distance in the first place. This is one of the reasons why the Europeans do not feel compelled to fully side with their American allies – in addition to the fact that the US administration does not have a plan to deal with the wider challenges Iran poses, besides increasing the pressure and waiting for the regime to crumble, regardless of the consequences. In fact, some believe that demonstrating this cleavage was part of Washington’s intention when it had Secretary Mike Pompeo announce the gathering during his hastily conceived trip to the region in January. Not only did he surprise even the authorities in Warsaw, but the choice of venue was a deliberate attempt to break ranks among EU member states: Poland is a country whose populist right-leaning government is in conflict with Brussels and fellow members over rule of law issues and craves for US protection against Russia, so it is ready to toe Washington’s line on Iran, if needed. Holding a conference on the Middle East without Iran, Turkey, or Russia (who actually held a summit on Syria on the very same day), and with only limited participation from Europe was never a good start, even without the war rhetoric. The difficulty for the Europeans is to counter this confrontational approach with a strategy of their own, for which they need unity of purpose and the respective means to implement it. Both are hard to muster if at the same time the transatlantic alliance is put into question by Washington. The EU is right to take a more comprehensive approach to the region, resisting the singling out of Iran as its main source of evil. Yet it has to carefully craft its approach without endangering the security alliance it fundamentally depends on. Cornelius Adebahr is a political analyst and entrepreneur, and the author of Europe and Iran: The Nuclear Deal and Beyond (Routledge 2017). He consults with European political institutions, international think tanks and universities, as well as civil society organisations on issues of European integration, foreign policy, and citizens’ engagement. He is an associate fellow at the German Council on Foreign Relations (DGAP) and a lecturer at the Hertie School of Governance, both in Berlin. The issue is very simple. Either you believe in the rule of law or the law of the jungle and endless wars. The EU-3 reached an agreement with Iran on her nuclear programme as early as 2005, but the Bush administration stopped that deal. Then after years of hard negotiations between Iran and the five permanent members of the Security Council plus Germany (and not with the United States alone) they reached a landmark agreement, unique in the history of nonproliferation talks. That agreement was also unanimously endorsed by the EU and the Security Council. It blocked all the paths to Iran’s acquisition of nuclear weapons and drastically reduced Iran’s peaceful nuclear activities to which, unlike Israel and North Korea, she is entitled as a member of the NPT. Then the Trump administration, goaded by a number of neocons who have always advocated war on Iran on fictitious excuses, withdrew from that agreement. Some leading figures in the administration have openly announced their evil desire to “bomb Iran” with the aim of bringing about a regime change. They clearly wish to create another Iraq, Syria, Libya or Yemen out of Iran, for which mainly the Europeans will have to pay. Under these circumstances, what do you expect the Europeans to do? Do they have to bow down to America’s illegal and warmongering diktat, or should they try to uphold the international law and help Iran to get closer to the West and build a stronger democracy, something that is sadly lacking among US’s regional allies? It’s time people woke up and saw through US’s aims before another and greater catastrophe is perpetrated in the Middle East by neocon zealots who lied us to the war in Iraq.